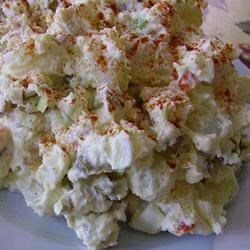 "This is a deliciously rich German potato salad, easy and perfect for summer BBQs. It is definitely full-flavored with bacon, green onions, sour cream, olives and other yummy ingredients...Always a hit with all our family and friends!" Place the potatoes into a large pot and fill with enough water to cover. Bring to a boil and cook until tender enough to pierce with a fork. Drain, cool enough to handle, and cut into cubes. Meanwhile, cook bacon in a large skillet over medium heat until browned and crisp. Remove from the pan with a slotted spoon and drain on paper towels. Reserve bacon grease. In a large bowl, combine the potatoes, sour cream, mayonnaise, mustard, green onions, olives, eggs, Italian seasoning and ranch dressing. Crumble the bacon into the bowl and pour half of the reserved bacon grease over all. Stir gently until everything is evenly distributed. Garnish with a dash of paprika before serving. I made it by the recipe except I left out the bacon drippings. My husband loved it. A really delicious dish. I used only 1 cup of light sour cream and just a tablespoon of the bacon drippings and it was plenty of rich dressing.